CITES export records for lion trophies from South Africa (virtually all of them from canned lions) for 2014 (CITES records are always about 2 years behind in compilation) show that a record number of 1150 trophies were exported. This is a 20% increase over exports from 2013. Where did all those canned lions go? I’ll only list the countries that imported over 20 trophies, so here we go: Australia, Canada, China, Spain (largest importing country with 54), Mexico, Poland, Russia. And of course, the biggest importer was the USA with 696 trophies or about 60% of the total. Things have changed since then in terms of legislation. Australia, France and the Netherlands recently banned all lion trophy imports. The EU Commission made trophy hunting imports slightly more difficult, but is still scientifically inexplicably wedded to allowing lion trophies to be imported. The USA recently listed lions on their Endangered Species Act and import permits will be more difficult to achieve. The film Blood Lions made a massive impact worldwide by documenting the sordid practice of lion breeding for the purpose of trophy hunting. The Professional Hunting Association of South Africa determined that any member participating in canned hunts would be censured (although there indications they are softening their stand after complaints by the breeders). 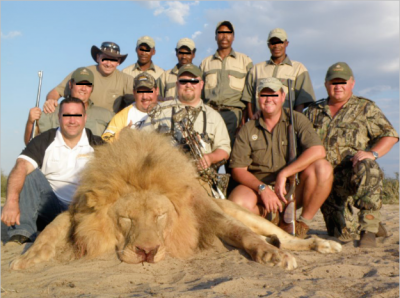 Trophy hunting associations in Germany in particular have distanced themselves from the practice, though the Dallas Safari Club and the Safari Club International in the USA are still fine with canned hunts. South African Environment Minister said last year that there was no such thing as a canned hunt. The practice is now laughably redefined as a “ranch hunt” to attempt to make the killing more acceptable. Let’s ensure that this year and the next will see an end to breeding lions for the bullet in South Africa. World opinion is clearly opposed, and as long as South Africa continues to mess around with this industry, they will see significant numbers of educated wildlife tourists electing to travel elsewhere.